1: Dice the onion and crush the garlic. 2: Heat the Donegal Rapeseed Oil and sweat the onion, garlic and herbs for 2 minutes. 3: Add the cashew nuts and the cranberries. Then add the pepper, nutmeg and breadcrumbs. 4: Use to stuff your meat and simply shape in tin foil and its ready for the oven. 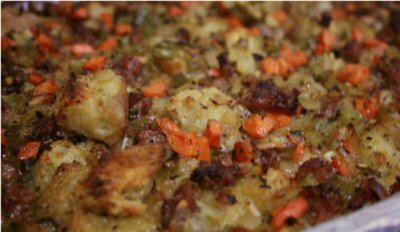 5: Bake at 190 Degrees for 25-30 minutes on reheat to achieve a crusty stuffing or simply reheat for 1 minute for a soft texture stuffing.